Nevertheless, an accident during computerized navigation raises the possibility the container ship's computer system could have been hacked and the ship deliberately steered into the USS Fitzgerald, an Arleigh Burke-class guided missile destroyer. A more likely explanation is that collision was the result of an autopilot malfunction, or the autopilot's warning signals, used to notify the ship's operators, were missed. 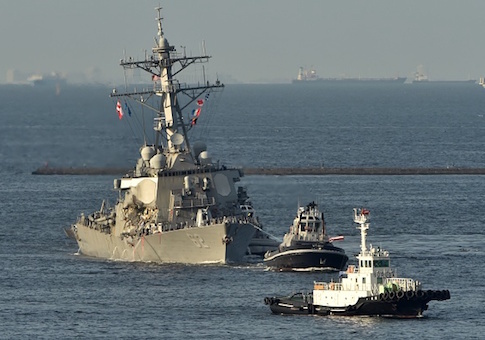 The destroyer was severely damaged when the protruding undersea bow of the cargo ship struck Fitzgerald on the right side. Seven sailors died as a result and the captain and two others were injured. It was the Navy's worst accident at sea. The collision occurred at around 1:30 a.m. local time but was not reported by the freighter's crew until around 2:25 a.m. Investigators believe the time lag was the result of the crew not realizing they had hit another ship. The Fitzgerald's AIS data was not available so its track was not reported publicly. "There are multiple U.S. and Japanese investigations underway to determine the facts of the collision," Richardson said in a statement. "Our goal is to learn all we can to prevent future accidents from occurring. This process will unfold as quickly as possible, but it's important to get this right." After impact, the freighter's was not immediately aware that it had collided with anything and continued sailing. The ship's crew then realized it had been in a collision and sailed back to try to determine what had happened. The Navy and Coast Guard are investigating the incident. The Fitzgerald is currently at its home port of Yokosuka naval base. The investigation is expected to be completed in several months. For the Navy, investigators are trying to determine why the ship's radar and other sensors did not detect the Crystal in time to take steps to avoid the collision. "We were struck by the stories of heroism and sacrifice—by both the sailors on board and their families back home—as they fought the damage to their ship and brought her back to Yokosuka," Richardson said. The ship's commander, Cmdr. Bryce Benson was airlifted by Japanese coast guard helicopter. Two other injured sailors also were evacuated. All appear to have injuries that are not life threatening. The Crystal is classified as a mid-size container ship part of the Asia Container Express or ACX, an Asian container shipping trade subsidiary of NYK Line, a global shipping division of Japan's Mitsubishi. This entry was posted in National Security and tagged Military, Navy, Philippines. Bookmark the permalink.